Whether you have broken up with your microwave to protect the nutritional value of your foods or just to save counter space, you shouldn't be condemned to a life of cold leftovers. Here are some simple ways to warm food without nuking it. Use steam to reheat foods that were originally cooked in water or steamed. It's ideal for rice, quinoa, pasta, dumplings, and plain veggies. Don't steam foods you want to be crispy or saucy foods. Place food in a bamboo steamer or stainless steel steam basket. Put that into a saucepan or pot that has about 1/4 to 1/2 inch of water. Using medium-low heat, allow the steam rising from the boiling water to heat your food. Most foods will heat in just a few minutes using this method. Reheat beans, soups, gravies, and saucy foods that don't need to be crispy in a saucepan on the stove top over low or medium heat. Warm cereals like oatmeal can be reheated the same way, but you should stir often and add a splash of water or your favorite milk to keep it from burning. Reheat tofu scrambles, stir fries, veggie "meats" or meat, and foods you'd like to keep somewhat firmer in a pan over medium-low to medium heat. Heat a very small amount of water or oil (start with about two teaspoons) to the pan, then add the food. Toss often to heat everything up in just a few minutes. Casseroles, breads, pies, veggie "meats", meat meats, and foods that were originally baked or roasted should be reheated in the oven. Fried foods are best reheated in the oven too. Place food in an oven-safe casserole dish or baking dish/tray. If you don't want the surface of the food to be crispy, cover with aluminum foil. 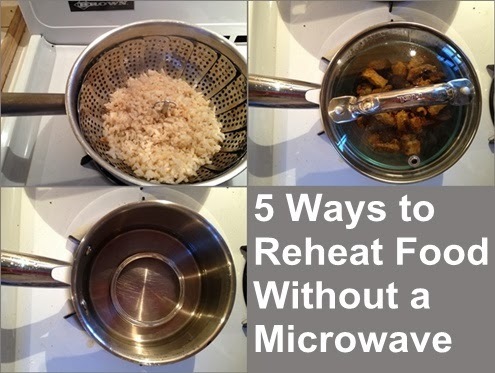 A good default temperature for reheat is 350 degrees. The amount of time it will take for your food to reheat depends on how deep/thick and cold it is. Don't wanna turn on the oven? An easy way to warm an entire dish of food packed for lunch in a glass food storage container is to use a double boiler method. Put a mason jar ring in a saucepan. Add some water to the pan; one inch should do it. Place the covered or uncovered container of food on the ring. Cover. Use medium-low heat and let the boiling water heat the food. Be very, very careful when removing the container.